Photorific is a premium WordPress theme great for photography and portfolio websites but can also be used for other projects. With Photorific, you can set as many background images as you want for every page, post, & portfolio item. The image will be automatically stretched to fit the users browser. This theme also comes with a color picker, 30+ shortcodes, 3 widgets, an AJAX contact form, unlimited sidebars and much more. You can also choose your own fonts for regular text, and choose from 7 preinstalled cufon fonts that look great. You can upload unlimited images for each page, post, portfolio item. The image will automatically stretch to users browser. You can choose your own colors for- Navigation Links Colors, Search bar background, Logo Color, Text color, headings color and much more. 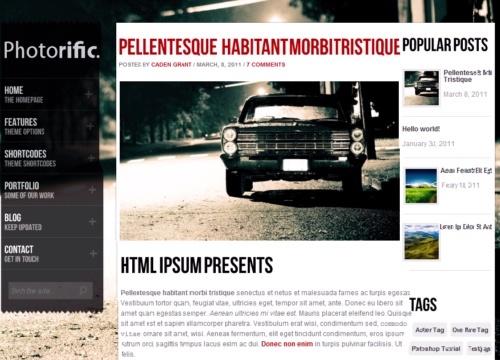 Photorific theme displays pretty Photo Lightbox that supports video for portfolio. You can create individual sidebar for each page. Planning to buy Photorific theme from Theme Forest. Buy with Confidence. This page provides you with all possible Buying options. Usually Buying options or Pricing page of any theme designer is designed for conversions (to attract users and convince them to buy). Our Buying options page is not like that. We provide all the information about each Buying option. No hidden text or terms. We tried to cover everything that you should know before buying this theme.